The bottom line is that not every single piece of toner powder is going to be used to create a finished product. The toner is pulled from the cartridge and adheres to a roller, known as an imaging drum. This drum is charged to attract the toner, which is how they come together. The drum continues circulating until it meets the paper that has a stronger charge, pulling the toner from the drum and bonding it with the fibers of the paper. However, the extra laser toner particles continue turning with the imaging drum. If the waste bottle wasn’t present, the toner powder would eventually just fall freely into the machine, creating a mess and sometimes compromising the quality of future prints. The waste toner bottle catches that extra toner that has technically been used but not applied to the paper. Regardless of whether the unit is monochrome or color, only one waste bottle is used. For those wondering why a waste toner bottle is not an included part of their printer, many models have larger cartridges that are two-fold, with a section that holds the toner powder and a compartment to catch the excess toner. Models that require a waste toner bottle will have a sensor that informs the printer when the bottle is full. Some units have an error message show up on an LCD screen while others use an LED light system that may require users to refer to the manual to figure out what the issue actually is. When removing the full waste toner bottle, do so carefully and slowly, trying to avoid getting any toner on clothes or skin. Once the bottle has been extracted from the machine, it is imperative that the openings are closed with the plugs attached to the outside of the bottle. If this step is skipped, an absolute mess is sure to ensue. It is highly recommended to replace the full waste toner bottle with a new one, though some would argue that each bottle can work for more than one cycle if thoroughly cleaned out. Considering how long each bottle lasts and how inexpensive a new one is, it is clearly a better option to just replace it. How to dispose of the bottle or the toner is another dilemma, as areas have different sanitation regulations. The best option is to contact local waste disposal facilities to find out specific policies for products of this nature. 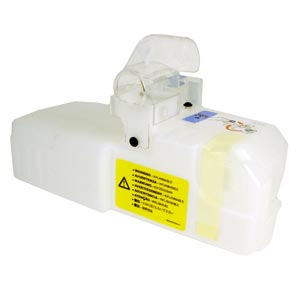 The waste toner bottle is an essential part of many laser printers, but most users will not have to worry about the maintenance it requires. A waste toner bottle will most likely only need to be replaced once during the life of the printer, if at all. « Will Using Compatible Cartridges Void a Manufacturer Warranty?